Engineered with meticulousness, the Skullcandy in ear headphones reproduce stereophonic sound with impeccable precision. The ear buds are perfectly contoured letting you plug them easily into your ears without you having to worry about them slipping out. Furthermore, the close-fitting ear cups also ensure the isolation of peripheral noise ensuring an augmented listening experience. 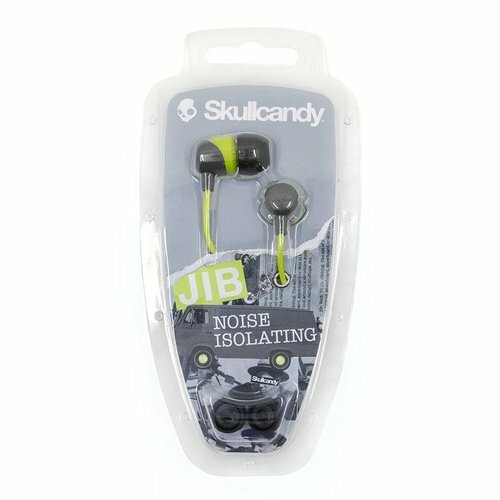 These Skullcandy JIB Rasta headphones come with a gold-plated 3-mm audio jack making it compatible with a range of devices including an iPad, iPhone, MP3 player, PC and a host of gaming consoles. The headphones' lengthy jack cable offers you the flexibility in movement while you're lapping up your choice music. Packaging Details Each product comes with its original own packing. Then they are packed with bubble sheets followed by high quality corrugated sheets for safer transit. We are importers and wholesalers for all mobile accessories. We are leading suppliers in our area. We have a very huge catalogue, so it is not possible to upload all our products here. If you want anything please contact us.